Taking care of a vehicle is never easy. 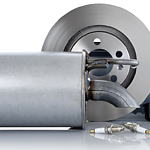 Whether you drive a Volvo SUV, sedan, or sporty car, it's possible to develop exhaust problems that need to be fixed. Even with regular maintenance checks and oil changes, problems can arise. Here's what you need to know. First off, make sure you understand the signs and symptoms of exhaust leaks. Do you notice a strange popping noise when you turn on your car? Have you been noticing vibrations in the steering wheel as you drive? What about your gas mileage? Have you noticed it's been lower than usual? These are all warning signs of an exhaust leak and indicate that it's time to bring your vehicle in for a repair check. Don't wait to get the help you need. It's time to reach out so we can assist you in moving forward.